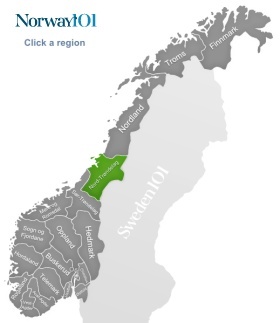 Nord-Trøndelag is Norway's fourth-least populous region, and the largest cities all don't have more than somewhere around 20,000 inhabitants – but don't let the “lack” of people give you the wrong idea. Nord-Trøndelag is a fascinating region of Norway, with lots of history, culture, and as it's usual for Norway: plenty of lovely nature to explore. The region of Nord-Trøndelag was quite an important region during the Viking Age. One example for that is the Battle of Stiklestad. This big battle took place in 1030, and counts as one of the most famous battles of the history of the Vikings in Norway. It is in this battle that King Olaf II of Norway was killed. His half-brother then became the king but he didn't live that much longer because he died during a failed invasion of England. Not a very lucky family, right? A play based on the battle of Stiklestad is performed in Stiklestad every single year (in July). Nord-Trøndelag is partially an agricultural region today, as a lot of grain is grown in the very fertile lowlands of Nord-Trøndelag. An even more important economical factor is the production of timber, and Nord-Trøndelag is the second largest producer of timber in Norway (the biggest one is Hedmark). 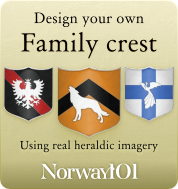 In the past, Nord-Trøndelag was a place of iron mining in swamps, steam ships, and Viking culture. A lot of example of the worship of the Nordic gods and goddesses can be found in this Norwegian region. While tourism might not be a super huge factor in this region, you can take advantage of some fantastic ways to become more involved in the Norwegian culture, history, and heritage. Did you, for example, ever wonder what it would have been like to live like a Norwegian fisherman? Maybe you found out that your ancestor was one of them? Then you can live like him! The region of Nord-Trøndelag prides itself on offering genuine, coastal heritage experiences, e.g. you could spend a few days in a traditional fisherman's hut or even stay in a lighthouse, and imagine what kind of responsibility it was to make sure that the ships and boats did not end up on some of the rather dangerous cliffs of this region. There are also plenty of cultural heritage museums along the coast (as much of the life is centered along the coast of Nord-Trøndelag), so if you are after heritage without the tourism, then this Norwegian region will be able to help you. If there is one place that attracts tourists like no other in this region, then it is the Nidaros Cathedral. In the summer months, around 250.000 people visit this cathedral, so it can become busy at times. The construction of the Nidaros Cathedral began in 1070, and it took 130 years for the construction to be finished. The Nidaros Cathedral is the most Northerly medieval cathedral you can find in the world – which of course adds to the attraction's magnetism to tourists. The reason why this cathedral exists is also noteworthy as it was built as a memorial for King Olaf II of Norway, who fell in the Battle of Stiklestad. While the Dolmsundet Adventure Park offers a lot of interesting activity for children, it also is a great place for adults with an interest in history because the Dolmsundet Adventure Park features a traditional Viking long-house and grave mounds. Did you ever wonder about what real pirates lived like? Then Bussekaillstua on the island of Fjellværøy would be a great place for you to visit. The cave which had been used as living quarters by pirates is accessible via a guided tour that allows you to enter the cave, and which will tell you a lot about the life of those pirates and their influence on the surrounding region. Hopsjø dates back to the 18th century and used to be one of the largest trading posts in the region. The country store (most likely the oldest one in the whole country) is still open for you to buy goods. There is a whaling museum, different exhibitions by local artists (in summer only), and an old packing house at the wharf that has been turned into a restaurant. Another popular visitor attraction is the German Stabben Fortress, which was built by the Germans in 1941. The Germans had chased all inhabitants of Stabben away because they needed the homes for their own troops. Around 2,500 Germans and their prisoners were living in Stabben fortress. Today, you can visit a museum in one of the towers, walk through the tunnels and explore the gun sites.